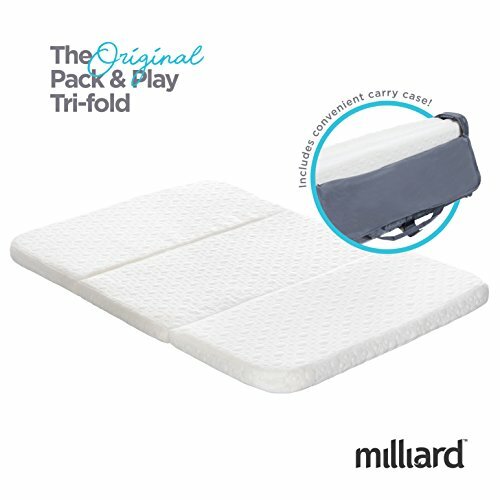 SLEEP IN COMFORT - Help your child sleep better by replacing the thin, hard mattress that comes with the pack-n-play. Constructed from top quality, high density foam, this mattress provides the perfect balance between firm support and soft comfort so your little one can sleep better - and you can too! MAXIMUM PORTABILITY - Milliard original trifold design allows you to easily fold up your mattress into the bonus carry bag that's included for free - so you can easily store or travel with your mattress. It can be used without a playard as well for the perfect toddler sleeping mat. WATERPROOF COVER - Comes with a top-quality, polyester cover that's both waterproof and washable so you never have to worry about keeping your mattress clean. MORE DETAILS - Measures 38x26x1.5 with rounded corners for a perfect universal fit. Soft mattress is not intended for infants and small babies. Please allow 24 to 48 hours for foam to expand after opening.